Home » Live Reviews » Live: Trans-Siberian Orchestra in D.C.
Live: Trans-Siberian Orchestra in D.C.
Over the years Trans-Siberian Orchestra has become a huge staple for the holiday season. For many fans their winter show is a tradition. 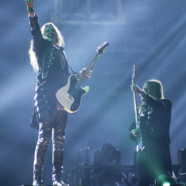 This year’s The Ghost Of Christmas Eve Tour highlights all the amazing music TSO has brought to fans over the years. With lasers, pyro, and one impressive stage setup this tour is an extremely powerful and exciting experience. I was able to catch the tour at the Capital One Arena in Washington D.C. and it is exactly what I needed to put me in the Christmas Spirit. It is unbelievable the amount of detail that is put into a TSO show. The graphics that are played throughout the show are absolutely stunning and the way that everything syncs up with the music really mesmerizes the crowd. The group played the classics such as “O Holy Night” and “What Child is This”. They also played fan favorite “Christmas Eve/ Sarajevo 12/24”. My personal favorite part of the show is the narration from Bryan Hicks between songs that tell the story of Christmas. His voice is perfect for telling the story and it always gives me goosebumps. The chemistry between guitar players is another thing that really makes the show a lot of fun. 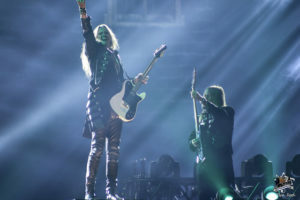 Chris Caffery and Joel Hoekstra are unstoppable on stage and at one point Caffery got off of the stage and played in crowd. Hoekstra had a few impressive guitar solos throughout the night that the crowd absolutely loved. Trans-Siberian Orchestra have created one of the best concert experiences over the years. With their extreme attention to detail and passion for what they do it is guaranteed that anyone would have a good time at one of their events.